Something happened Oct 6 that had never happened before in Shelby County, Indiana. Wabash alumni descended on a dilapidated house in Shelbyville to rehabilitate it, as a part of Shelby County’s Habitat for Humanity and the county’s inaugural celebration of Wabash Day. The Wabash men were responsible for a variety of jobs in the house from helping with interior work to building the floor of the deck – whatever was needed on the house. See Photo Album here. "This was an old dilapidated house," said team captain Curt Johnson ’94. "They knocked a lot of it down and built it from scratch basically. We thought would be blowing insulation but they weren’t ready for it. We kind of had to role with the punches." According to Johnson deciding what project the group would work on was fairly simple. "Lux (Chris Lux ’96) and I had a brainstorming session over some beers one night," he said. "We thought that since Judge Tandy was in with Habitat and he’s a Wallie it made sense." Shelby County Superior Court Judge Jack Tandy ’79 had been involved with many Habitat project over many years in the county and served as project manager for the house the Wabash alums worked on during Wabash Day. "It’s a neat way of bringing people together," Tandy said. "The guys are from a variety of eras from Wabash. Some of them know each other, some of them don’t. Doing something positive for this community is a great thing." Many different eras were represented, with graduates ranging from Phil Brown of the class of 1958 to Brady Rife of the class of 2000. They all worked side by side to ensure a needy family in their community would eventually have a home to live in. Many of the older alums who had never participated in the Wabash Day before appreciated the experience. 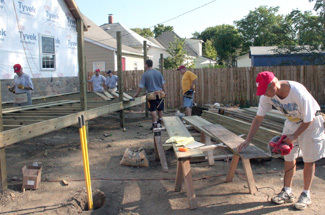 "I think its wise to promote our own community and help do some service here," said Jim Peters ’71. "We all live in Shelby County and the camaraderie of Wabash grads is nice. We don’t get together all that often but this gives us a chance." Peters added that he will participate next year if the alums decide to have another Wabash Day event. All in all, Johnson was happy with the way the first of hopefully many Wabash Day celebrations in Shelby County. "I think we have over 30 alums in the county," Johnson said. "We’ve got a dozen or so guys here. Not bad for the first year"
"I’m pleased," he added. "The weather’s good, the turnout’s great." 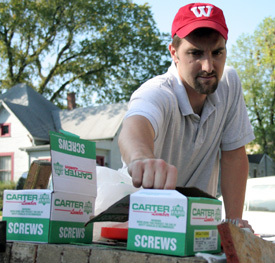 In photos: Upper right, Brady Rife '00 reaches for some nails. At lower left, the group of Wabash men working on the house in Shelbyville.